The World's Most Expensive Dog House! We thought we'd brighten up your Monday with some uber posh dog houses—the kind you'd like to curl up in if given the chance. Samsung has designed a a $30,000 dog house for the canine who has everything...and then some. Check out the short video below to get the details. 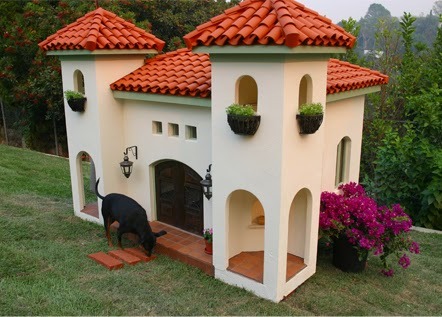 Here's just one example: A Hacienda style, luxury dog house with an asking price of $30,000. By the way, does anyone actually own or need a "dog house" anymore? I thought Parental Unit's entire house was my dog house—how about you? Me taking over Parental Unit's bed...who needs a dog house? We've never been inside a dog house before but this one looks pretty nice to us! It will fit very nicely in our family room! Dat are one pawsome lookin dog house. Hmmmm, we think we're going to ask dad to build us our own! BOL! WE agree..... we would rather our peeps spend all that on SNACKS and TOYS. Can you imagine $30,000 worth of doggie snacks and toys? Hoo boy, I'm swooning!